So, Valentine’s Day is coming up, and you want to make something special for that someone special, but you don’t really cook. Or you won’t have time to cook. Or you’re going out for a fabulous dinner, but want to start the day off with a hot pink surprise. Or you want a fun, healthy, hot pink treat for the kids. I’ve got you covered with this Hot Pink Smoothie. 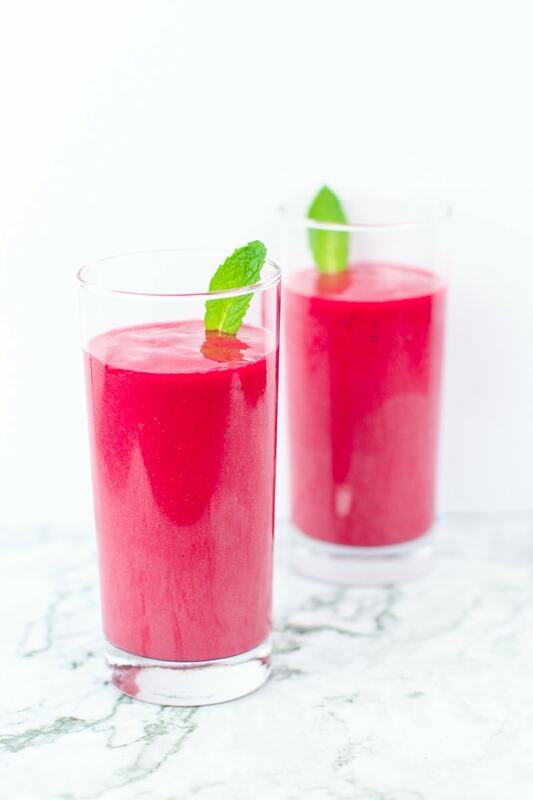 This hot pink smoothie recipe is what I call a 3 x 3. Just three ingredients, and it’s ready in three minutes or less–including rinsing out the blender! It’s healthy, with no added sugars–just whole food raspberries and banana. It’s simple—just throw it in the blender and hit the button. And the fresh mint makes each sip feel light and refreshing, and the whole drink just a little bit fancy. Plus, berries are brimming with anti-oxidants, so much so that Dr. Greger of NutritionFacts.org recommends we all get at least one serving of berries a day. Of course, some berries have more anti-oxidants than others and as it turns out, raspberries are one of the best. 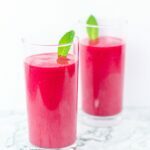 This hot pink smoothie is a quick and easy breakfast or snack everyone in the family will go for. It’s just slightly sweet, so if you wanted to sweeten it a bit more for the kids, you could add some apple, or replace some or all of the water with a naturally sweetened fruit juice. Happy Valentine’s Day, my friends. Here’s to you, to love, and a to long, healthy life. Cheers! 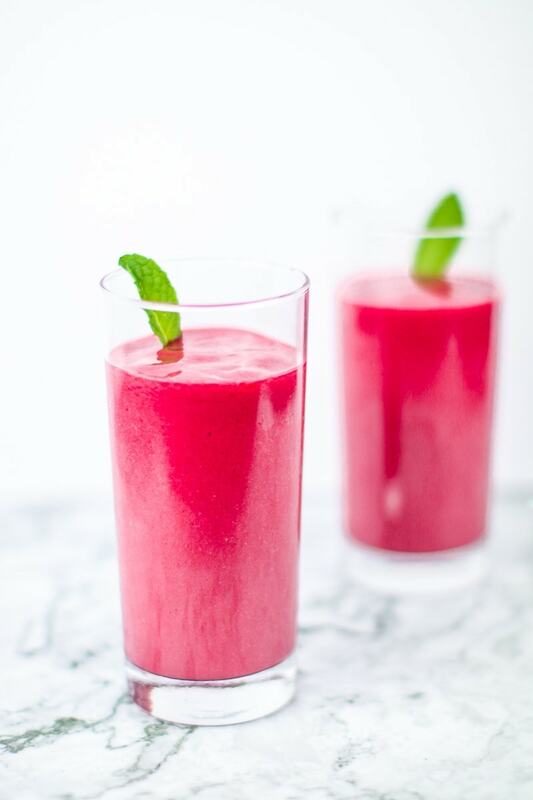 A vegan pink smoothie made with raspberry and banana, that's light, refreshing and perfectly healthy. 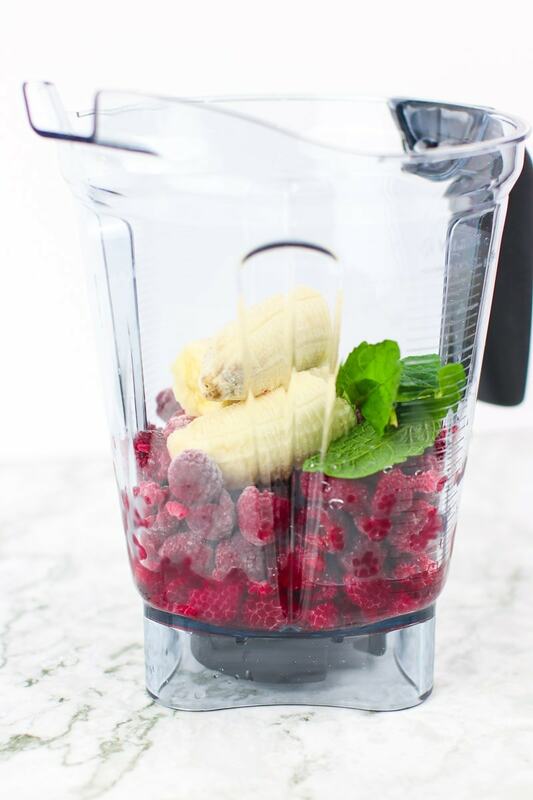 Place all of the ingredients in a blender, and process on high for 1-2 minutes or until smooth. If you don't have a very powerful blender, you may need to thaw the berries a little by either 1) placing in a colander and running under hot water for a couple of minutes or 2) adding warm water to the blender rather than cold. Happy Valentine’s Day to you as well! I love a simple smoothie that let’s me check off 2 items on my daily dozen list. I never seem to remember to eat my fruit, and smoothies make is so easy and tasty. I’m with you–love mint on just about everything.